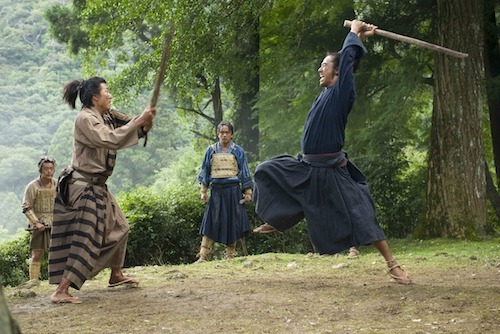 Following a massively successful festival circuit, ELEVEN ARTS has licensed North American distribution rights to Yoshinari Nishikori’s award-winning period action-drama TATARA SAMURAI. The L.A.-based distribution company, whose recent titles include THE LEGEND IS BORN: IP MAN, UZUMASA LIMELIGHT, SAILOR MOON R: THE MOVIE, and SWORD ART ONLINE THE MOVIE - ORDINAL SCALE -, have set a June 2nd theatrical release for the film, which is produced by EXILE HIRO. TATARA SAMURAI is the latest feature from visionary director Yoshinari Nishikori, whose films, KONSHIN and RAILWAYS were box office smashes in their native Japan. His latest historic epic stars Sho Aoyagi (YAKUZA APOCALYPSE), pop star Naoki Kobayashi, AKIRA (LEGEND OF THE FIST), Tomoko Tabata, and Anna Ishii. Gosuke (Aoyagi), a young villager in Sengoku Period Japan, is trained to be a blacksmith, but forced to become a warrior. After joining the Oda Army to protect his hometown of Tatara, he begins to question whether swords are a viable defense against the new technology of firearms - but soon discovers that his skill as a blacksmith might very well be the most powerful weapon he has to protect his home.